Case: A life and health agent hatched a scheme and recruited a network of agents to enroll unsuspecting consumers into a unauthorized health insurance product with "AIM/CEO" (Association of Independent Managers and Chief Executive Officers Club). To the victims' surprise, there was no authorized insurer underwriting these health policies. Compounding matters, the organizing agent held regular conference calls with other agents and provided them a multitude of marketing materials to perpetuate the sale of the unauthorized health insurance. The net effect was numerous consumers were left in the lurch without health coverage while the agent lined his pockets with premiums. Many of the other agents, some of which claim to have been "duped", had enforcement action taken against their licenses for soliciting and selling an unauthorized health product, which they failed to verify was authorized. Disposition: License revoked and permanently barred from the insurance industry. Case: An investigation of a general lines agent, who was also the agent-in-charge of an agency, alleged he aided and abetted an unlicensed individual in the transaction of insurance. The unlicensed individual was the owner of the agency. Disposition: License revoked. The agency owner was arrested by the Division of Insurance Fraud and is facing multiple felony charges. Case: A former title insurance agent whose license had been revoked was discovered during a routine follow-up investigation to be working in a title agency in direct violation of the Order of Revocation, which stated that she could not be employed in any manner by any insurance agent or agency. The former agent claimed that she ignored the Administrative Complaint because her appointments had been cancelled due to CE noncompliance. It was the agent's inaccurate opinion that since she had no appointments, her license was not valid and therefore, the Department could not take any action against her license. She later petitioned the Department to amend the Order of Revocation by striking the wording that prevents her from being employed in any manner at a title agency. Disposition: A Final Order was issued denying her petition to amend the Order of Revocation. She was arrested by the Division of Insurance Fraud and is now facing a felony charge. Case: An investigation of a nonresident surplus lines agent alleged that he overcharged Florida consumers during surplus lines transactions. More specifically, he was charging fees, including policy fees, exceeding $35.00. Disposition: Fined $40,000; placed on probation for one year; and must not charge fees of any kind, other than a policy fee not exceeding $35.00, in relation to surplus lines insurance policies covering subjects of insurance resident, located and/or to be performed in Florida. Case: An investigation of a mortgage field services company, which inspects and maintains defaulted and foreclosed properties, alleged that it and its employees were acting as unlicensed public adjusters. Disposition: Fined $25,000 and must cease and desist from acting as an unlicensed public adjuster. Case: A life, health, and variable annuity agent was investigated and it was alleged she was and is a funeral director or direct disposer, or an employee or representative thereof, or that she has an office in, or in connection with, a funeral establishment. This was in violation of Section 626.785(1)(d), Florida Statutes, which lists the requisite qualifications for licensure as a life agent in the state of Florida. Case: An investigation of a title insurance agency alleged that it offered unlawful inducements to affiliated entities for the referral of title insurance business, charged an unlawful fee, and failed to refund recording fee overcharges. 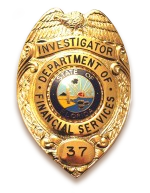 Disposition: Fined $6,250; probation for one year; provide refunds for recording fee overcharges to listed consumers and a mandate to provide refunds for additional overcharged consumers that may become known in the future; must have operating capital and net worth comparable to independent title agencies in the market area in which it operates and sufficient capital to conduct all the work and provide all the services typically provided by a title insurance agency in the market area where it conducts business; must manage its own business affairs, pay fair market rent for office space, common facilities, for equipment and shared space, and pay fair market value for all goods and services it receives or uses and all facilities that it occupies in its business; must be staffed with its own employees who will work exclusively for it; must employ licensed title agents to perform primary title services; will actively compete in the marketplace for title insurance business; will actively market its services; will seek title business from persons other than affiliated entities. Case: An investigation was opened after the Department received allegations that a bail bond agent was recommending specific attorneys on his agency's website. Upon review of the agency's website, it was discovered that he had six specific attorneys mentioned, including their websites and phone numbers. There was also a banner scrolling below the listings which stated "Don't chance picking an attorney at random from the phone book. Call one of these and know that you are talking to the best!!!" though this violates the law. The agent's interpretation of the law was that as long as he was recommending three or more attorneys, or in this case six, he was not suggesting any "particular" attorney. Disposition: Fined $5,000 and shall not suggest or advise the name for employment of any particular attorney to represent his principal.